Our High School Wednesday night gathering is called koinonia, which is the Greek word in the Bible for "fellowship." And that is really our goal, eating together (See below! ), laughing together, loving on each other, worshipping the Lord and hearing from His Word. One of the main focuses we have for this next season of our High School ministry is building our friendship and community with one another and with those who don't know Christ. And what better way to do it by just being together? koinonia meets on Wednesdays nights from 7:00 to 8:30pm in the Student Center. Please eat dinner before you come! Can’t get enough koinonia? We’ve got you covered! 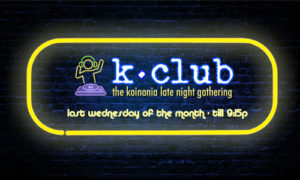 On the last Wednesday of every month, koinonia is get extended hours until 9:15p with the new k-club! This is a chance to go beyond our regular koinonia schedule with an added bonus of finishing the night with some fun. Don’t miss this month, on February 27 where we host our S.A.D. Dance Party! Come ready to have some fun and celebrate the month of love… or singleness! Miss our koinonia dinners? We’ve added a new koinonia dinner club that meets on the first Wednesday of the month at various restaurants around town. We meet at 6:00p and then head up to the church for koinonia at 7:00p. 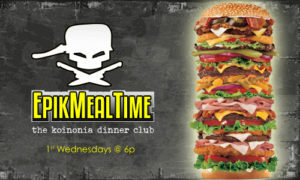 Don’t miss our next Epik Meal Time at TBD.